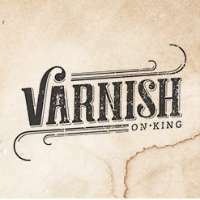 Varnish on King located in Perth source the best food, best wine and best whiskey to share with your friends all day long. At Varnish on King we promise to source the best of the best to share with their friends, Varnish On King boasts an extensive collection of bourbons and whiskeys that rivals what anyone else in the city has done previously. Bottle upon bottle of Kentucky bourbons and American whiskeys line the shelves behind the bar, making up Perth's most extensive range of bourbons, whiskeys, ryes and other spirits. Varnish On King also offers innovative food from Head Chef David Allison, the ex-chef at Vue du Monde in Melbourne and Rockpool Bar & Grill, with a fusion of American classics with an Australian twist; from fried chicken wings with popcorn and buttermilk dressing, to venison loin with picked beets and smoked mayo. The venue's interior pays its respect to the nouveau dive bars of the States, but throws a sly nod to Perth's own history with sepia-toned images of the neighbourhood's yesteryear lining the walls. For reservation, bookings and enquiries call or visit Varnish on King today.